Shot from the Sierra Ancha Wilderness in central Arizona facing south. One of our wonderful monsoons kicked up quite a stir. Wow, that is National Geographic quality..Well done. What a lovely image. Really nice. 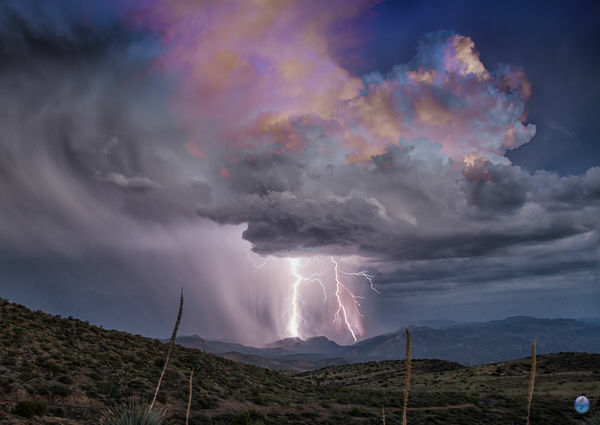 My wife and I are relatively new to Arizona living in Tubac and last summer I was amazed. I never realized how intense these storms can be. Hope to get out some this coming Monsoon season and try a couple like this. Thanks for the inspiration. Indeed it does look mean--nice capture. Wonderful. Would love to see this in the download version.